When looking for a new car, most of us will only ever see the finished product. Even those lucky enough to be able to specify bespoke or upgraded features may not consider the work that goes into manufacturing our motors. In manufacturing plants, certain qualities are needed to ensure a time and cost effective working process, suitable to yield the high quality standards that we’ve come to know. Manufacturing plants need a solid foundation, able to support heavy machinery, wheeled equipment, dropped tools, chemicals and the weight of the cars themselves. 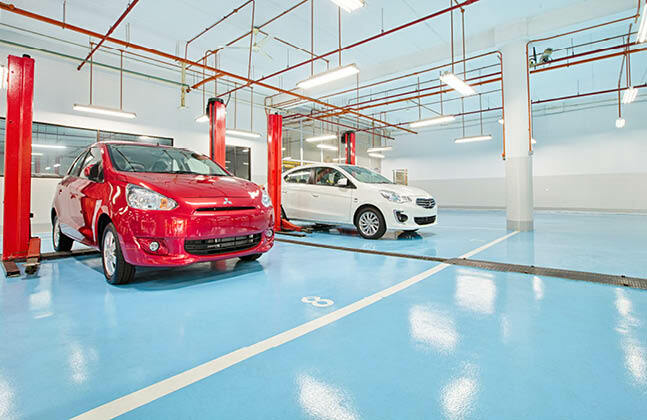 A solid concrete substrate with a durable epoxy coating is ideal for environments like this. A material that suits the car manufacturing industry very well is Flowcoat SF41. 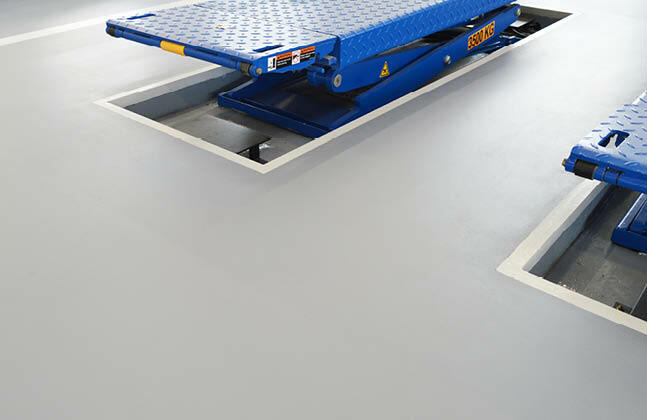 This high performance, chemical resistant and solvent free epoxy resin coating is very hard wearing against vehicle traffic. 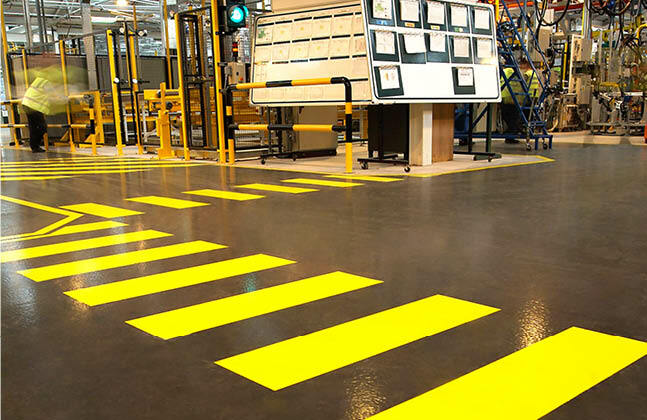 As well as being abrasion resistant, this material is also slip resistant, creating a safer environment for staff. 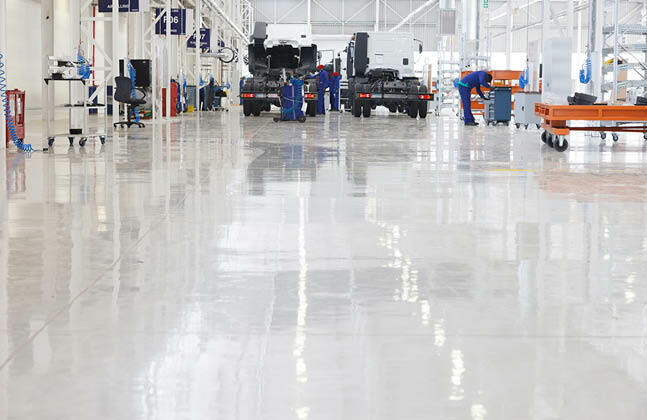 This epoxy resin coating has also been used in Cheshire-based Bentley Motors. The ability to customise a Flowcoat SF41 finish means that it can be made aesthetically pleasing with bright colours in corporate tones and vibrant demarcation. 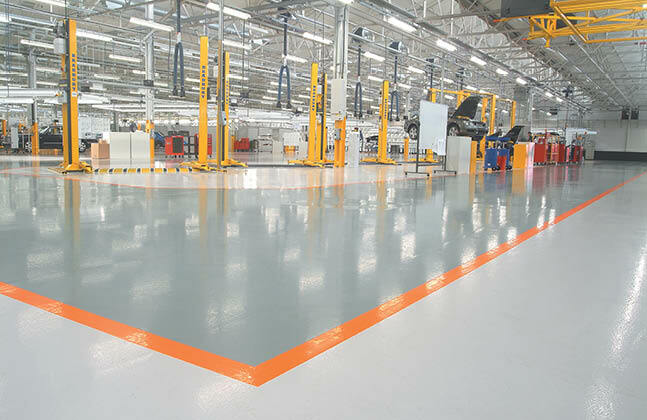 Flooring properties like these have been very useful in state-of-the-art plants such as Bentley, where customers can travel to the factory to see their car being built. Demarcation outlines where visitors can and cannot be on the site. Alternatively, the self-smoothing resin finish of Flowshield SL is ideal for processing areas that are subject to medium-heavy traffic. Similarly to Flowcoat, this is well suited for use in areas exposed to foot, trolley and rubber wheeled traffic. The seamless, joint-free application also makes this surface extremely easy to keep clean, perfect for plants that regularly allow visitors. Many car manufacturing plants like Bentley in the UK allow visitors, and often have organised tours showing everything from the stitching on the seats to the finished product. This means that the site needs to be visually pleasing, so that visitors can clearly see the manufacturing process, but also remain safe to reduce the risk of incidents. A great way of keeping these sites both organised and safe is to create zones on the floor. These zones can signify no entry areas, walkways and spaces to store different materials. The example above uses bright yellow lines as zebra crossings, clearly showing walkways to visitors and employees. The thick yellow lines around the light coloured sections also show the confines for materials, which contrasts to the black roadways, which must remain obstruction free. 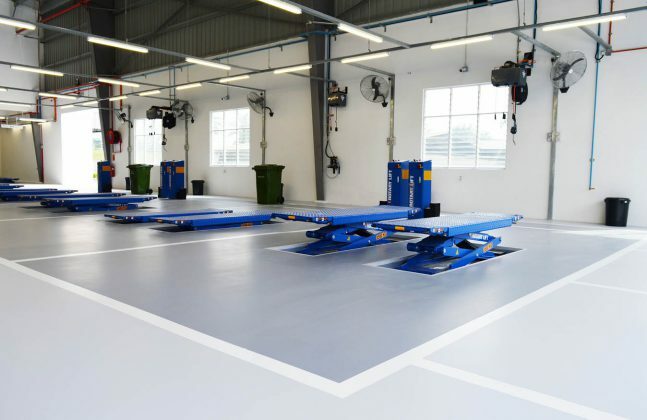 Using one bold colour on the flooring also means that dropped tools, manufactured parts or spillages can show up much more easily and be tidied away to avoid incident. Join us next week to continue the journey from manufacturing to the showroom. In the mean time, please leave any comments or questions below.